Congratulations to our January Athlete of the Month, Renee Hansen! Having new members join and integrate into the gym, especially members whom have done CrossFit before, can be a long process. It can take time to get comfortable in a new space, with new coaches and newmembers. Every gym has its own vibe and rythym that takes time to learn. As coaches we do our best to make these new members comfortable and work to make them part of the existing fabric of the community over time. But every once in awhile, a member will join who fits in so well and is so kind and welcoming of others that they become part of that fabric almost overnight and you can't quite imgaine them having not been there all along. That is how we as coaches feel about our January Athlete of the Month, Renee Hansen! Renee, along with her husband Carl, joined Hierarchy in July of last year. 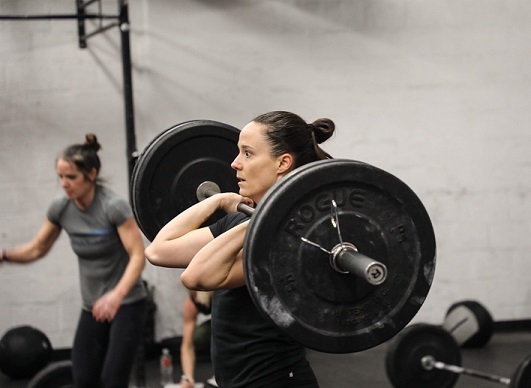 Renee was an excellent athlete already when she arrived, and has procedded to absoulutely crush the next 6 months of training, setting multiple PRs (like her power clean last night!) and winning the Rx division of the Holiday throwdown, and completing the 6 minute bar hang workout in only two(!) sets. Beyond that, she has become a integral part of the noon crew, as well as moonlighting occasionally at the 5 and 6. Shes a blast to have in class, oh and she can also bake too, and there is no faster way to a CrossFitter's heart than baked good as everyone knows. But honestly we having her in these classes not only as a willing and coachable athlete, but because there is almost no one at Hierarchy quicker to cheer on others during and after a workout and that means the world to us. We are so proud of Renee and cant wait to see what she does in 2019. Congratulations Renee! Read on below for more about Renee's story! I was born and raised in Southern California. I graduated from the University of California San Diego. In San Diego I met this cute guy in the Navy, married him, and now we move around a lot. My then boyfriend (now husband) was into CrossFit. He tried for three years while we were dating to get me to start. He taught me some weightlifting and we would do some metcons at the base gym but I was too intimidated to go to a CrossFit gym. After his safe return from a deployment to Afghanistan, I was willing to indulge his request and go to an actual CrossFit gym. 1.) Why didn't I start this sooner?! 2. )Those women are strong af! I wanted to be strong like the women I saw in class. I wanted to have an activity I could do with my husband. I think so. I'm always working on getting stronger/better and I get to bother Carl during class. It's a win-win situation. A resounding YES! We've moved 4 times in the last 5 years. CrossFit has always provided an instant community and support wherever we go. CrossFit also helps me mentally as much as it does physically. 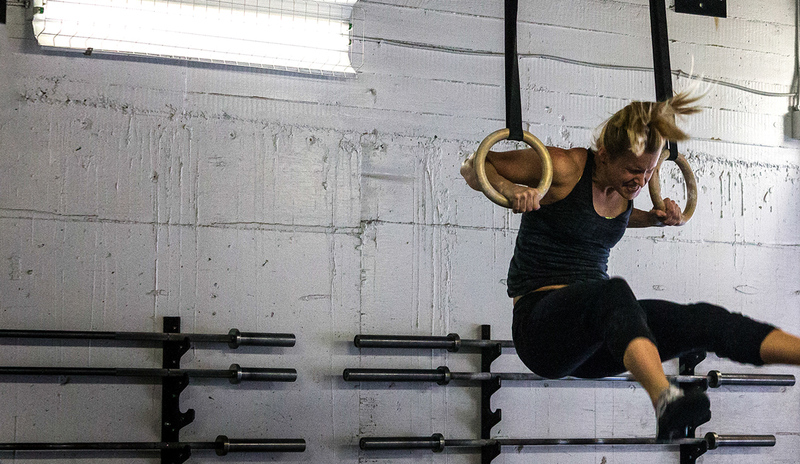 I can be a high-stress, high-anxiety person and CrossFit provides a daily release for any negative feelings. CrossFit Hierarchy means so much to me because of all the small things. It's not the PRs, it's the people. It means Dave telling me something is "my" workout because he remembers I love deadlifts and running. It's Eva continuing to give me muscle up cues as I struggle to figure out how to throw my body through the rings. (Shout out to all the people who have cheered me on during all my almost muscle ups) It's Tyler believing I can finish a workout much faster than I think I can. Hierarchy means inside jokes with noon, days of the week clapping with the evening, and partner wods on the weekends. To me, CrossFit Hierarchy means a daily opportunity for improvement and hanging out with some pretty awesome people. 1.) Ask questions. Some movements are confusing and the terminology may be new. Do not be afraid to ask for help because the coaches have a wealth of information. 2.) Make friends. There are so many amazing people at the gym. Get to know them. Coming to work out with your friends will keep you consistent and provide people to commiserate and celebrate with after the wods. 3.) Comparison is the thief of joy. Be proud of your accomplishments. Celebrate the accomplishments of others. What others can do does not take away from what you can do. Diane is definitely a favorite, but mostly I love a good long chipper. I also like running. There, I said it. Don't hate me. Any time the word "sprint" is mentioned. I prefer to pace things out. The assault bike is also a soul crusher. I don't actively dislike any lift, but I do have a lot of fear about putting the bar over my head during snatches and jerks. I lived in the Middle East in Bahrain for two years. I once won a giant, game show style check. I make really good cinnamon rolls.